JD Power 2015 has reveled its ratings for customer satisfaction for this year. Mercedes Benz India customers are the happiest with dealer service in the luxury car segment. Maruti Suzuki India becomes the best after sales service provider among mass market automakers for the 16th time consecutively. 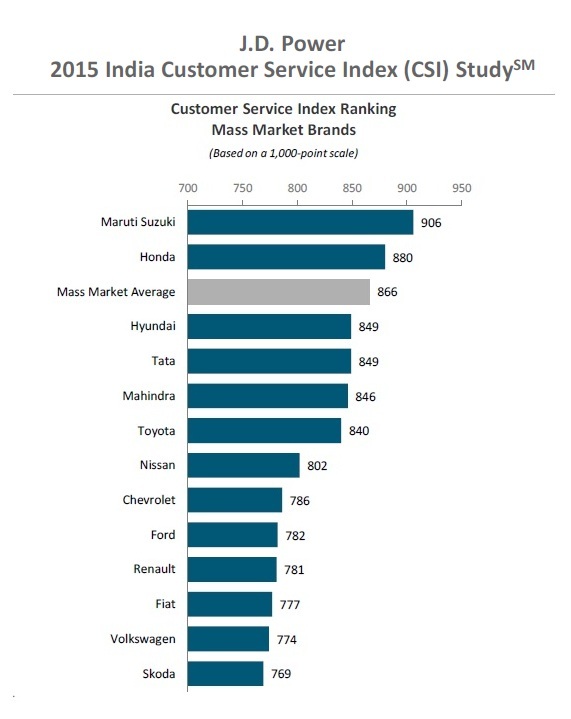 The study is conducted every year to rate the automakers on their service. The results affect a lot to the companies yearly sales. The study is conducted among customers who visit company’s authorized dealerships in period between 12 to 24 months of their purchase. The study is based on five factors : service quality (43%) service advisor (14%) service facility (14%) vehicle pick up (17%) and service initiation (11%). Maruti Suzuki has scored a whooping 906 points out of 1000 points in after sales service followed by Honda at 880 points. The JD power study was conducted between May to August 2015 and includes owners who have bought their cars between May 2013 to August 2014. Maruti Suzuki has improved the overall customer satisfaction by 10 points from 856 in 2014 to 866 in 2015. The greatest improvement is seen in the service initiation with 14 points added. The pick up has increased 20 points from 866 to 886 with 1 out of 6 customers getting pick up and drop facility. Facilities such as TV, internet connection, seating and refreshment counter at service centers have led to an increase of 42 points from 852 to 908 points. The same day deliver leads to a 51 point increase from 822 to 873 points. These services make India’s largest automaker the best after sale service provider. The study was conducted among 7,498 owners. 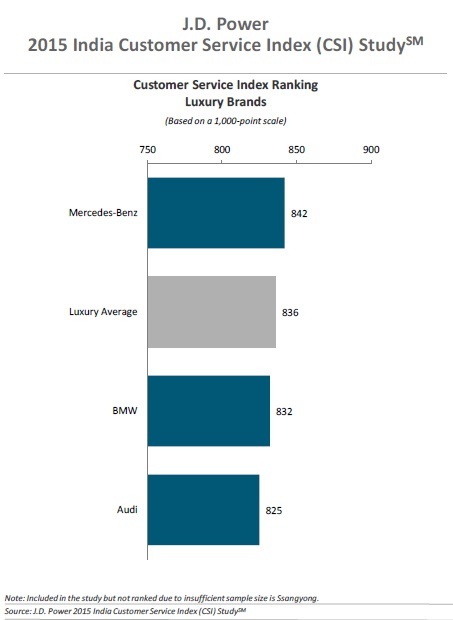 Mercedes Benz India has been ranked first with a score of 842 points in dealer service in the luxury car segment followed by BMW at 832 points and Audi at 825 points. The JD Power study was conducted among 265 luxury car owners who has bought the vehicles between May 2013 to August 2014 and have visited the dealerships between October 2014 to August 2015. Same day service satisfaction has increased 30 points from 817 in 2014 to 847 in 2015. The interaction with service advisor has decreased from 74% in 2014 to 57% in 2015. The customer loyalty can be judged by the following figures : 79% owners stated that they would return to their dealers for post warranty services and 85% owners reported that they would recommend their dealerships to their friends and family.